Math: We are hard at work on learning our addition strategies. We are practicing using the Counting On method. 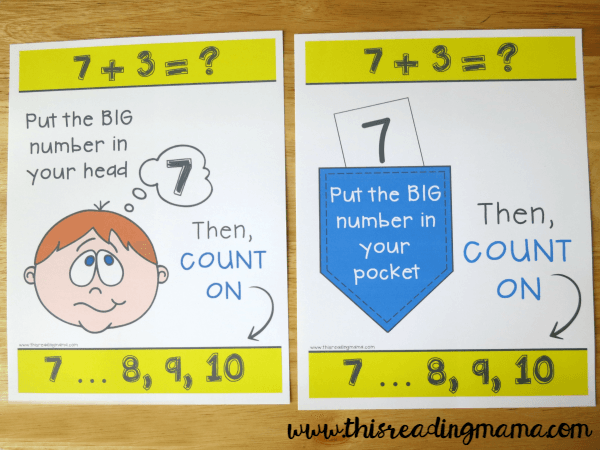 Counting on is where you look at an addition equation (ex: 3+6) and you put the bigger number in your head (6), then you count on from the bigger number (start at 6, count on 3 more=9). 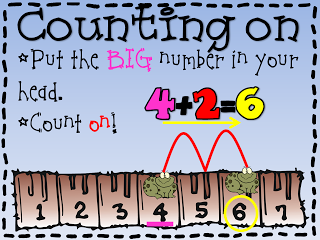 We are practicing doing this with a number line, using our fingers, with manipulatives, and in our head. We also are working on the commutative property of addition (if 3+6=9, then 6+3=9 too). We sometimes call these "flip-flop facts" because they are the same when we flip them around. We also are practicing making a ten and seeing how making ten can help us solve all kinds of addition problems. 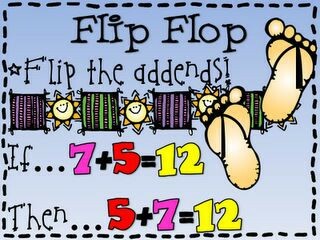 Next week we will learn more addition strategies to help us become more confident with our addition skills. We will work on these and then transition into our Addition within 20 unit. Phonics: This week we working on short a words. We practiced building simple CVC and CVCC words that have short a (ex: back, rat, sad, etc.) We are reviewing all of our letter sounds and working on short vowels. We are working on identifying initial and final sounds as well as blending and segmenting. I am teaching the students body codes for all of their sounds which makes learning and reviewing sounds more fun! Reading: We reviewed how to pick a just-right book and are working on our stamina for read to self. I am beginning to do one on one reading assessments with the students to identify their individual reading levels. Writing: We are still focusing on not being afraid to write and being able to get our ideas down on paper! Students are being given sentence frames to help them formulate a complete sentence from their ideas. Students write almost daily in their journal to practice. A letter is coming home in your child's homework folder about Xtramath.org. Xtramath is a great website for students to practice their addition facts. It is a timed activity meant to help students become more fluent with their arithmetic skills. The letter contains a username and PIN (password) as well as instructions on how to access the program from home. Please let me know if you have questions! A reminder that homework comes home with your child on Fridays and should be returned completed the following Friday. This week and next week we will continue with whole class spelling. After the end of September, we will transition to Individual Spelling. Students will still all work on some of the same pattern words every week. However, in addition to those words students will be assessed and assigned 5 spelling words at their own personal spelling level to practice and study each week. Students will begin being tested on these words on Fridays. I will update you with the exact date this will begin along with any other important directions at that time. THANK YOU, THANK YOU to all the wonderful families who have donated so many items off our wish list! It is appreciate so much more than you know. I will be out of the classroom next Thursday (9/22), Friday (9/23), and the following Monday (9/26) for my wedding in Lake Tahoe! Those of you who know me better than others know I get major anxiety just thinking about leaving my class for any length of time. Please be assured that I will be leaving detailed sub plans and ask my grade-level teammates to check in as well while I am out! Homework will still be due next Friday and new homework will still go out next Friday as usual! I do plan on transitioning to my married name (Mrs. Sarich, pronounced Sar like "sorry"-itch) after my wedding. I know that this is not ideal as some of the students are just now getting the hang of my name, but such is the life of a teacher crazy enough to choose to get married in late September :). My e-mail address will eventually be changed as well but IT has assured me that we can have my current e-mail forwarded to the new account. Thank you so much to everyone who brought flowers and cards to the classroom today to celebrate my birthday. I am lucky to have thoughtful students with sweet families.